Cameron Champ watches a tee shot during the final round of the Sanderson Farms Championship. Champ won for his first PGA Tour victory. While one World Golf Championships event concluded in the wee hours of the morning on Sunday — congrats, Xander Schauffele! — another finished on Sunday afternoon in Jackson, Miss. Here's what you missed at the Sanderson Farms Championship. Who won: Cameron Champ (21 under) Why it matters: The 23-year-old Texas A&M product is a Tour rookie and regarded as one of the promising young talents in the game. He had only one professional win to his name (the Web.com's 2018 Utah Championship) before his victory on Sunday, which came in just his ninth start on the PGA Tour. How it happened: Champ held a four-shot lead heading into the final round, but Corey Conners bit into it quickly. Conners played the front in three under, while Champ played it in one over. All of a sudden they were tied for the lead heading to the back side. Conners made birdies on 13 and 15, but Champ did one better, making four straight birdies from 13 to 16. Champ added a final birdie on 18 to beat Conners by four. Both players shot four-under 68s on Sunday. How it almost didn't happen: Champ broke his driver less than 30 minutes before his tee time. Luckily he had a backup handy, and while he wasn't as effective off the tee as he was in the first three rounds, he still got the job done. https://twitter.com/jlmountainman/status/1056589245354295296 Best shot(s) when it mattered: Champ pulled away with four straight birdies on the back nine from Nos. 13 to 16. On 16 he drained a 38-footer for birdie, and on 17 he missed the green with his approach, had a mediocre chip and then faced a 15-footer for par. No matter, he nailed it, which allowed him to take a comfortable two-stroke lead to the 72nd tee. https://twitter.com/PGATOUR/status/1056651078945595392 Honorable mention for best shot when it mattered: Champ, after a wayward drive on 18, did this. https://twitter.com/PGATOUR/status/1056658312857477120 Best closing round: Carlos Ortiz shot an eight-under 64 to vault into a tie for third. He had an eagle, bogey and seven birdies. Best quote: "This last year has been amazing. I was in school at this time last year." 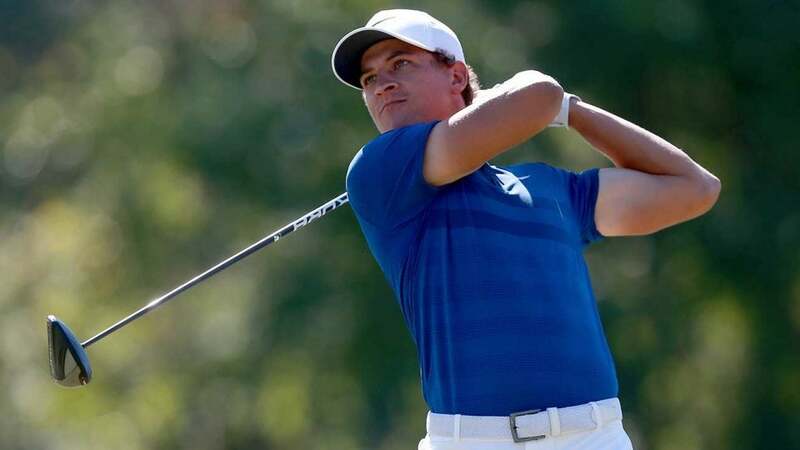 — Cameron Champ Up next: The PGA Tour heads to Vegas next week for the Shriners Hospitals for Children Open.